Special Benefits for Military: Deployment/PCS rate: Get 4% APR on all balances for up to 12 months during deployment or PCS. After 12 months, the variable Regular APR of between 12.15% to 28.15% will apply. This rate will vary with the market based on the prime rate. 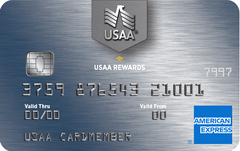 Our take: The USAA Rewards American Express Card is one of the best cards around for active-duty service members, but its mediocre rewards program and high APR for cardholders with less-than-perfect credit limit its appeal.